The abrasive and resin structure for the 3M™ Trizact™ Cloth Belt 237AA is formulated to break down under medium pressure and keep fresh, sharp mineral cutting to provide consistent finishes on hard metals such as carbon and stainless steel. Our belt also features a grinding aid that helps prevent heat buildup, warping and discoloration. 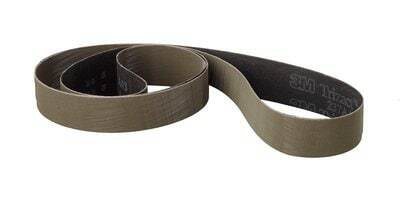 The belt is constructed on an X-weight, durable cloth backing that helps provide control, conformability, and effective medium-pressure grinding. The resin bonded abrasive gives you greater heat resistance and helps prevent delamination.The belt uses a Film Media Splice, a strong secure bond joining the belt ends, consisting of a thin film-joining media that minimizes "chatter marks," ensures a smooth running belt, and consistent finishing results. When compared to conventional abrasive products, proprietary Trizact™ abrasives produce a finer finish, achieve results faster, and last longer.Unlike conventional abrasives, our line of 3M™ Trizact™ belts start sharp and stay sharp, resulting in more predictable finishes and improved, consistent quality. 3M™ Trizact™ belts can last up to five times longer than conventional discs and provided precise finish control such that operators can reduce grade sequences, requiring fewer process steps and fewer abrasive products. Three-dimensional structures uniformly distributed over the entire surface of 3M™ Trizact™ abrasives ensure consistent performance and eliminate disc-to-disc variation.